A menu isn't just a list of dishes. It’s an important piece of marketing material. As the saying goes, the first bite is with the eye, and therefore a restaurant menu design says a lot about a restaurant, creating an initial impression before the customer has even seen any food or drink on offer. In short, a restaurant menu design is a reflection of the restaurant itself. So, menu descriptions, layouts and colors, whether formal, casual or playful, should match your restaurant concept, location and theme. Creating an effective menu is more than just printing out a list of items. You should add something special to make your menu stand out in a crowd. 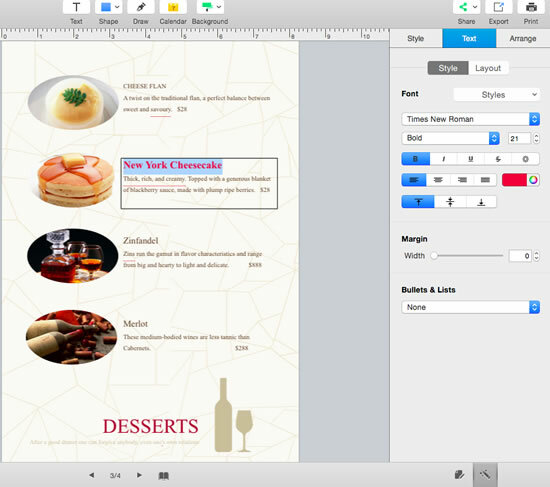 Here, a variety of professionally designed restaurant menu templates provided in Publisher Plus will help you create a standard menu to fit your restaurant style and ensure your menu is a memorable first impression. 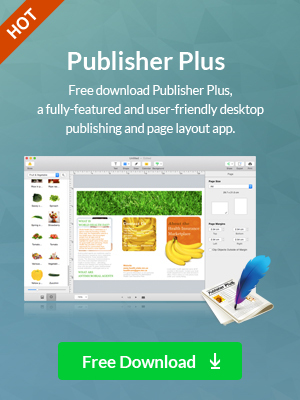 Just free download this powerful page layout application and get the following steps on how to make an attractive restaurant menu. With these free restaurant menu templates in Publisher Plus you can easily make an eye-catching menu with minimal effort. Launch this quick menu maker and then click Menu category to find a template that best matches the style of your restaurant. 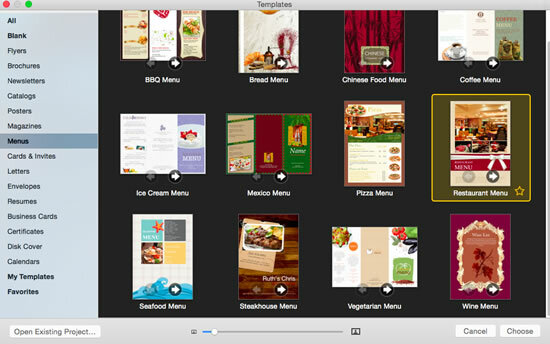 Next double click it and start customizing your restaurant menu design. Adding a proper background into your menu will change the look of these below menu designs suiting your restaurant style right away. 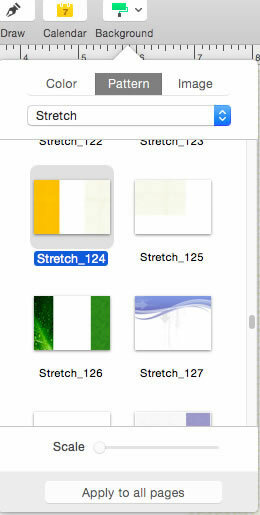 Click Background button on the top of window and then choose Color, Pattern or Image to set your background. Tip: For a fancy restaurant, dark color background will convey a sense of seriousness and professionalism. However, for a casual restaurant, warm and muted color background will look appropriately inviting and usually make the most sense. So, make sure your selected background is quite proper for your restaurant style. Click once on a preset photo you want to change and then drag your own photo from iPhoto in Libraries category or Pictures in Folders category onto it. In addition, you can click icon to choose Food & Restaurant clipart as your desired pictures. Tip: To make your menu look clearly, you should avoid adding too many pictures onto it. Double click the existing editable text boxes to type your own necessary information such as your restaurant name, food items, description and price. It’s necessary to highlight your item names and prices. Just click Text on the left window to customize the text style, color, size, layout, etc. at will. Tip: There is a laundry list of things to avoid on a restaurant menu, like hard to read font or overly descriptive language. Keep your restaurant menu design simple and avoid using too much culinary jargon. If you get satisfied with you restaurant menu design, you can directly click Print button on the top of window to print it out. 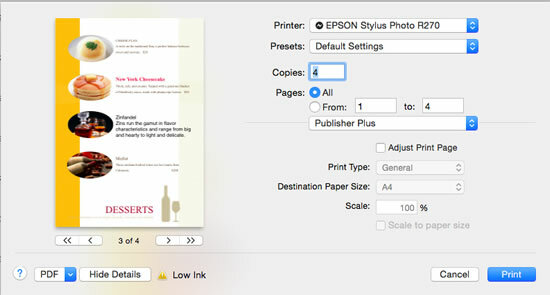 Also, you can make some print settings such as Copies, Pages, Size, etc to meet your personal needs before you print it out. 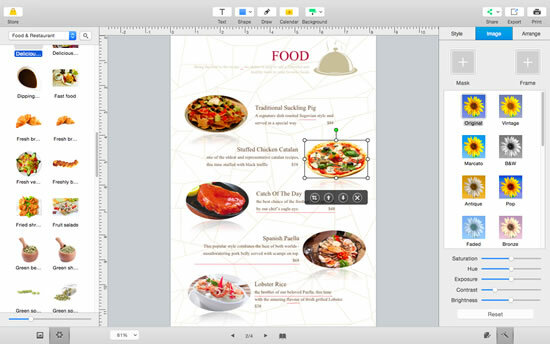 Whatever your inspiration, these professional restaurant menu templates in Publisher Plus will let you create an attractive restaurant menu design in just 5 simple steps.